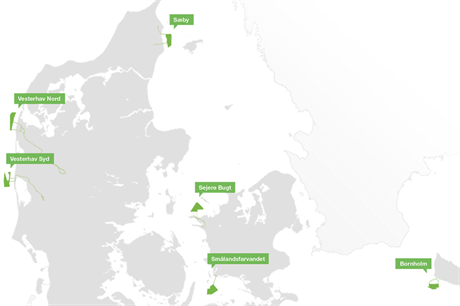 DENMARK: The Danish Wind Industry Association (DWIA) said it does not understand the rationale behind the government's proposal to cancel the 350MW nearshore tender and replace it with a Horns Rev 4 project, further from land. According to the trade body, the Danish government has proposed a new offshore project off Esjberg, western Denmark. "This would be a success story," the trade body said, before adding, "if the proposal was not subject to the ongoing tender of 350MW [of nearshore] turbines being shelved". The Danish government is currently negotiating changes to the public service obligation (PSO) support system in a bid to cut energy bills, improve industry competitiveness and comply with EU directives. However, to achieve this, the 350MW nearshore tender was identified as a potential casualty along with a proposed price cap on the 600MW Kriegers Flak offshore project planned for the Baltic Sea. DWIA CEO Jan Hylleberg said: "I expected the government to meet expectations and not change horses midstream." Hylleberg warned the move would affect investor confidence in Denmark and would result in big losses for the government. "At the same time the state will have wasted DKK 200 million [€27 million], and the three prequalified bidders may each make a great loss," he said. "The [350MW of nearshore] wind turbines would be installed and producing energy from 2019. But by my assessment, Horns Rev 4 would produce power at the earliest by 2023. So why postpone growth and up to 6,000 jobs here and now against an expected effect after 2020? "This means with the proposed Horns Rev 4, we get less green power and fewer jobs, while the government delays the green transition," Hylleberg added. DWIA suggested the nearshore projects would have been among the cheapest offshore wind in Europe. Danish energy minister Lars Lilleholt said on twitter: "Coastal mills are unwise. The future of 'green power plants' must stand in the sea - not near oour beautiful shores." The 350MW nearshore tender in Denmark — delayed due to bird protection concerns — was scheduled to take place in September. Three developers were shortlisted for the programme: Vattenfall; a WPD-Hofor joint venture; and a European Energy-led consortium. The DEA would then award the contracts to the companies that can develop the most capacity within the 350MW limit at the lowest total average price. Hylleburg had earlier said cancelling the tender would be "a political own goal". A Horns Rev 4 project would join the 160MW Horns Rev 1 and 209MW Horns Rev 2 — completed in 2002 and 2009 respectively — and the 400MW Horns Rev 3 in 2018 developed by Vattenfall, which reached a final investment decision at the start of June.